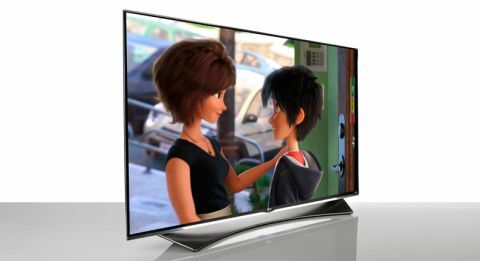 LG 55UF950V review | What Hi-Fi? The LG 55UF950V 55in 4K TV continues the encouraging start to the company’s 2015 TV campaign. Its mid-range 4K TV (65UF850V) got our hearts racing with its vivid hues, ultra-sharp lines and super-speedy operating system. And, ever since clapping our eyes it, we’ve been dying to get our hands on the company’s flagship 4K range. The UF950V is just that, in the mainstream sizes anyway – the very top-tier range comprises just 79in and 84in sets, and then there’s its prized 4K OLEDs. Here we have the 55in model, and it’s hard to look at it without being drawn to the stand. The range introduces LG’s premium ‘Auditorium’ stand: a curvaceous, angled slab of metal that, aside from providing a rock-solid base for the TV, awards it covetable status. More importantly, it’s designed to improve audio performance by reflecting the downward-firing sound towards the listening position. Plush and practical, then. The stand isn’t the only design initiative worthy of praise. Last year’s traditional and smart remotes have been rolled into one super-intuitive, multi-tasking – and in our minds, near-faultless – proposition. The main means of control is an on-screen cursor, operated by gyroscopic sensors, but there are physical keys too for when your arms get tired. The roller button is particularly useful for scrolling pages and browsing channels, and the take-it-or-leave-it voice recognition feature works well. Last year, LG introduced its fresh-faced operating system, WebOS, which received much praise for its slick, user-friendly interface – the ‘launcher’ menu with its pop-up display of colourful cards proved a welcome sight among competitor’s ‘hub’ designs. This year’s sets enjoy the second iteration, WebOS 2.0 – and we’re pleased to report that it’s even better than before. The improvements are more fine-tuning revisions than a full-blown revamp, and what you get is a speedier, more streamlined experience. LG claims boot-up time has been reduced by up to 60 per cent, and we can believe it. This set starts up in haste, running like clockwork from the get-go – and menus load in a flash. Getting around the TV is generally a swift experience – that’s in part thanks to a few new shortcuts. A sidebar emerges for basic settings so you don’t have to enter the full menu to make quick fixes. And inputs can be accessed quickly in a new drop-down bar, making it just as quick to switch between sources as it to change channels: flicking between Blu-ray, USB content or live TV can be done in just two or three button presses. There’s also an all-new ‘My Channels’ tile where you can bookmark your favourite channels. The most useful connections – three USB and four HDMI (2.0) inputs – are all handily side-facing if your TV needs to be up against a wall, and can accept 4K material. LG TVs are now up-and-running with 4K Amazon Instant Video. That, along with Netflix Ultra HD, means there’s almost a hundred hours of 4K goodness at your fingertips. BBC iPlayer and Demand 5 apps appear for regular (non-4K) catch-up TV, too. The LG Content Store provides a platform to watch movies, download apps (Twitter and Deezer among them) as well as manage installed items in ‘My Page’. LG TVs still feature SmartShare and ScreenShare, letting you share and display content wirelessly from a smartphone or tablet to the big screen. Despite the volume of 4K content clearly increasing in the past year, there’s still not much out there. Most people, therefore, will continue to binge on high-definition for a while to come, so we’ll begin there. And it’s a good start for the 55UF950V, which proves itself to be an excellent upscaler as we load up The Hunger Games: MockingJay Part 1 on Blu-ray. Despite the TV having to create three of every four pixels for itself (4K is four times the resolution of Full HD), there’s the sharpness and detail we’ve come to expect from the best Full HD sets. Crowds of people in the background are well defined, and it’s easy to detect the edges of rubble on ground. Even the texture of President Snow’s beard is tangible. But the LG can look a bit over processed – edges a little over emphasised – so foreground figures can occasionally look a bit like cardboard cut-outs. In motion sequences, the image remains composed as Katniss moves through the crowds. LG’s ColourPrime technology aims to boost colour gamuts and deliver ‘more than 20 per cent additional colour’. Indeed, the set has an eye-popping (if not completely natural) palette, which revels in lush greens and bold reds. It lacks the subtlety and shading we see in its direct rival, Samsung’s UE55JS8500 – especially apparent with skin tones – but you can’t deny its appeal. 3D playback is equally pleasing, the image filling the screen with fine detail, depth and clarity. We move further down in resolution, to a DVD of The Lord Of The Rings: The Two Towers. And thankfully the quality is a far cry from the softer, blurrier 4K sets of old (two years ago). Lines are crisp and detail in the orcs’ faces is palpable. Contrast is decent and colours have life. A bit of flicker crops up as figures charge through fields, but it’s nothing we can’t live with. Saving the best until last, we end by dabbling with 4K streams of Breaking Bad on Netflix and Bosch on Amazon Instant Video, both of which lend perfect opportunities to bask in pin-sharp pictures and startling detail. If you’ve never seen 3840 x 2160 resolution before, this LG TV is a fine advert for it. You don’t need close-up shots to clearly see the stubble in Jesse’s face or pick out grains of sand in the desert. Colours pop, from the different shadings of purple on Walter White’s stripy shirt, to the rich colours in his home’s upholstery and woodwork. LG has put some work into bulking up its TV’s sound, not just with the bespoke stand, but by going into partnership with Harman Kardon too. And it’s all to good effect. Exceeding the disappointment of most flat-screen TV speakers, the sound is solid, relatively substantial and full enough to put you off buying a budget soundbar, at least – although with a 4K set such as this, we would urge you to invest in a decent AV amplifier and surround speaker package to do the picture justice. All-in-all, the LG 55UF950V is a class act, and a decent option for those deciding that now is a good time to invest in 4K (which it is). It’s merely a touch of audio richness and video subtlety away from five-star fame.